By General B[irkett]. D. Fry. In the numerous accounts of the Battle of Gettysburg heretofore published, the writers have generally referred to the last effort made by the Confederate troops as "Pickett's Charge," and in almost every instance have conveyed the idea that no troops but Pickett's division took an active part in that fierce and tremendous struggle. Disclaiming any intention to detract in the least from the glory won on that day by the gallant Virginia division, or its heroic commander, who had then been for more than twenty years one of my most valued friends, I may be permitted to say that some injustice has been done to the division commanded by General Pettigrew. As colonel of the Thirteenth Alabama infantry, I was attached to Archer's brigade of Heth's division. That brigade opened the battle on the morning of July 1st, and during the fighting which immediately ensued General Heth was wounded, and the command of the division devolved upon Brigadier-General Pettigrew. General Archer was captured, and I succeeded him in command of the brigade. During the forenoon of the 3d, while our division was resting in line behind the ridge and skirt of woods which masked us from the enemy, Generals Lee, Longstreet and A. P. Hill rode up, and, dismounting, seated themselves on the trunk of a fallen tree some fifty or sixty paces from where I sat on my horse at the right of our division. After an apparently careful examination of a map, and a consultation of some length, they remounted and rode away. Staff officers and couriers began to move briskly about, and a few minutes after General Pettigrew rode up and informed me that after a heavy cannonade we would assault the position in our front, and added: "They will of course return the fire with all the guns they have; we must shelter the men as best we can, and make them lie down." At the same time he directed me to see General Pickett at once and have an understanding as to the dress in the advance. I rode to General Pickett, whose division was formed on the right of and in line with ours. He appeared to be in excellent spirits, and, after a cordial greeting and a pleasant reference to our having been together in work of that kind at Chapultepec, expressed great confidence in the ability of our troops to drive the enemy after they had been "demoralized by our artillery." General Garnett, who commanded his left brigade, having joined us, it was agreed that he would dress on my command. I immediately returned and informed General Pettigrew of this agreement. It was then understood that my command should be considered the centre, and that in the assault both divisions should align themselves by it. Soon after the two divisions moved forward about a hundred paces, and the men lay down behind our line of batteries. The cannonade which followed has been often and justly described as the most terrible of the war. In it my command suffered a considerable loss. Several officers were killed and wounded, with a number of the rank and file. I received a painful wound on the right shoulder from a fragment of shell. After lying inactive under that deadly storm of hissing and exploding missiles, it seemed a relief to go forward to the desperate assault. At a signal from Pettigrew I called my command to attention. The men sprang up with cheerful alacrity, and the long line advanced. "Stormed at with shot and shell," it moved steadily on, and even when grape, canister, and musket balls began to rain upon it the gaps were quickly closed and the alignment preserved. Strong as was the position of the enemy, it seemed that such determination could not fail. I heard Garnett give a command to his men which, amid the rattle of musketry, I could not distinguish. Seeing my look or gesture of inquiry, he called our, "I am dressing on you!" A few seconds after, he fell dead. A moment later- and after Captain Williams and Colonel George had been wounded by my side- a shot through the thigh prostrated me. I was so confident of victory that to some of my men who ran up to carry me off I shouted, "Go on; it will not last five minutes longer!" The men rushed forward into the smoke, which soon became so dense that I could see little of what was going on before me. But a moment later I heard General Pettigrew, behind me, calling to some of his staff to "rally them on the left." The roll of musketry was then incessant, and I believe that the Federal troops- probably blinded by the smoke- continued a rapid fire for some minutes after none but dead and wounded remained in their front. At length the firing ceased, and cheer after cheer from the enemy announced the failure of our attack. I was of course left a prisoner. As evidence of how close was the fighting at that part of the line, I saw a Federal soldier with an ugly wound in his shoulder, which he told me he received from the spear on the end of one of my regimental colors; and I remembered having that morning observed and laughingly commented on the fact that the color-bearer of the Thirteenth Alabama had attached to his staff a formidable-looking lance head. All of the five regimental colors of my command reached the line of the enemy's works, and many of my men and officers were killed or wounded after passing over it. I believe the same was true of other brigades in General Pettigrew's command. 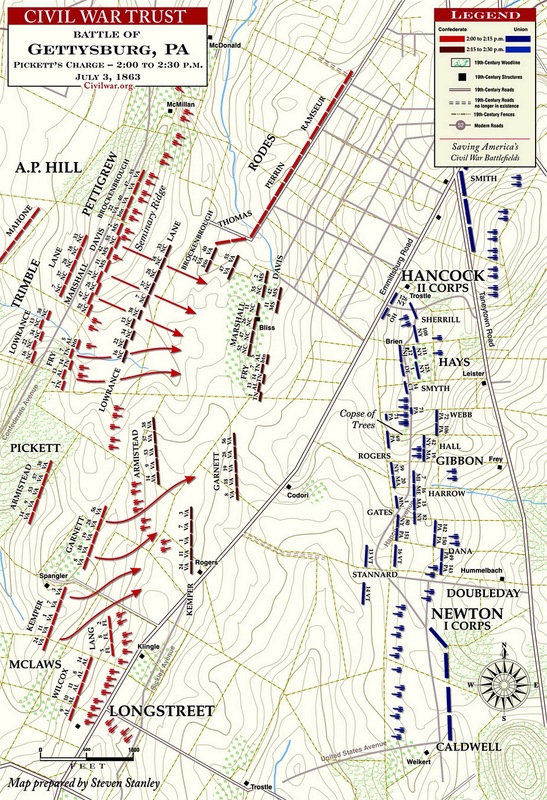 It is probable that Pickett's division, which up to that time had taken no part in the battle, was mainly relied upon for the final assault; but whatever may have been the first plan of attack, the division under Pettigrew went into it as part of the line of battle, and from the commencement of the advance to the closing death grapple, his right brigade was the directing one. General Pettigrew, who I know was that day in the thickest of the fire, was killed in a skirmish a few days later. No more earnest and gallant officer served in the Confederate army. Montgomery, Alabama, December 14th, 1878. Starting with a fresh point of view, and with no axes to grind, Into the Fight challenges all interested in that stunning moment in history to rethink their assumptions. Worthwhile for its use of soldiers’ accounts, valuable for its forcing the reader to rethink the common assumptions about the charge, critics may disagree with this research, but they cannot ignore it.